Salads are fresh, healthy and delicious - and infinitely adaptable. Katie and Giancarlo show how salads are perfect for any time of day and occasion - Watermelon, Feta & Mint for a refreshing breakfast, meat, fish and vegetable-based mains for a complete meal plus recipes for starters and side salads where salad plays a supporting role. They even cover sweet salads such as Roast Black Fruit Salad or Raspberries & Redcurrants with Whipped Ricotta for a healthier alternative to an indulgent dessert. 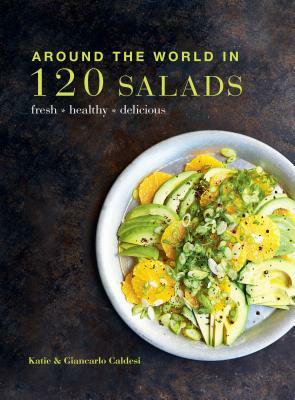 Featuring recipes from around the world you can enjoy Korean Roasted Duck with Five-Spice Fruit Salad or a spicy Mexican Beef Salad, sample Mediterranean flavors with Zucchini & Zucchini Flower Carpaccio and Greek Lemon Chicken or savor Middle Eastern classics such as Fattoush and Tabbouleh. With a selection of essential dressings to complement any salad, this mouthwatering collection of inspirational recipes will ensure you'll never be stuck with a limp leaf of iceberg lettuce ever again.